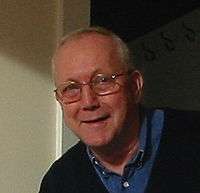 Carl-Wilhelm Reinhold de Boor (born 3 December 1937) is a German-American mathematician and professor emeritus at the University of Wisconsin–Madison. Born in Stolp, Germany (now, as part of Poland, called Słupsk), as the 7th of 8 children born to Werner (an anti-Nazi Lutheran minister) and Toni de Boor in 1937, he fled in 1945 with his family, settling eventually in Schwerin, then part of East Germany. As a child, he was often ill, suffering from a variety of conditions. In 1955, young Carl took advantage of the temporary political thaw following Joseph Stalin's death in 1953, obtained a 1-month visa to West Germany and biked there, then decided to stay when he learned there that his application to Humboldt University (in East Berlin) for the study of chemistry had been turned down (because of his poor performance in mathematics). However, Otto Friedrich (a brother of Carl's father's first wife) was willing and able to help him. Two years later, he met and fell in love with Otto's niece, Matilda Friedrich, the daughter of Carl Friedrich, the political scientist and constitutional scholar. With the support of the Friedrich family, Carl emigrated to the United States in 1959, learning English on his trip across the Atlantic (he could read Beatrix Potter when he boarded the boat). In 1997 he was elected to the National Academy of Sciences, and he received the 2003 National Medal of Science in mathematics. Other honors have included election to the American Academy of Arts and Sciences in 1987 and the National Academy of Engineering in 1993, honorary degrees from Purdue University and Technion (the Israel Institute of Technology), as well as membership in the German Academy of Sciences Leopoldina in Germany and the Polish Academy of Science. He won the John von Neumann Prize from the Society for Industrial and Applied Mathematics in 1996 and the John A. Gregory Award of Geometric Design in 2009. Carl is a lover of music—especially classical, and more especially Johann Sebastian Bach—walks, good food, and games of all sorts. In 1981, he bought his first personal computer, an Apple II with 32KB of memory with an old reel-to-reel tape recorder hooked up to store programs. He required his children to write any computer games they wished to play. With them he wrote an accounting program for tracking his checkbook, which he kept using long after the kids went to college, though he had to edit the program to use the Z key for recording a new transaction when the R key finally wore out, as well as implementations of a number of his children's favorite board games. He is a lover of the quirky and easily enthralled by art. He used to keep a print of The Garden of Earthly Delights in his dining room, to the distress of some of his children, and others. During his Madison years, he played the bass drum in the neighborhood 4 July Parade, and each August celebrates his arrival in America, where he is a citizen. ↑ ISI Highly Cited Author - Carl R. de Boor Archived March 4, 2006, at the Wayback Machine.